Ibis is the common name for any of the long-legged wading birds of diverse genera comprising the subfamily Threskiornithinae of the family Threskiornithidae, characterized by a long, slender beak that curves downward. These stork-like birds belong to the same family as the spoonbills, but the spoonbills have a flat beak that does not curve downward and is somewhat enlarged at the tip. There are about thirty species of ibises, placed into 12 or 13 genera, depending on the taxonomic scheme. Feeding in wetlands, shallow lagoons and lakes, and similar ecosystems, ibises provide important ecological values as part of food chains, consuming various invertebrates (crustaceans, mollusks, worms, leeches, etc.) and small vertebrates (amphibians, fishes) and being consumed in various life stages (eggs, nestlings, fledglings, adults) by various mammals (raccoons, coyotes, weasels, skunks) and birds (peregrine falcons, red-tailed hawks, etc.). They also help to aerate the soil as a result of their foraging habits. For humans, ibises also have been a source of food and feathers, and have been hunted for sport. They help in control of various pests, such as grasshoppers, and their unique forms and behaviors—in some species, they form large aggregations of a thousand birds in a flock or nesting colony—adds to the wonder of nature. Despite these values, loss of habitat, such as the decline of wetlands, and other threats have lead to six species being threatened, including one that is Endangered and three that are Critically Endangered. The critically endangered giant ibis, for example, has a population perhaps of less than 250 birds. 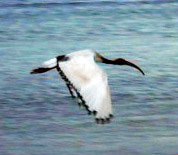 The sacred ibis, which was of great cultural importance in Ancient Egypt as a symbol of the god Thoth, has become extinct in Egypt, although it is common in other nations. 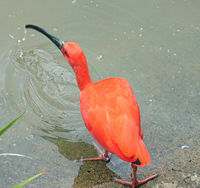 The ibis family, Threskiornithidae, includes two groups of large terrestrial and wading birds, placed into two subfamilies: the ibises, comprising the subfamily Threskornithinae, and the spoonbills comprising the subfamily Plataleinae. There are about 35 species and 13 or 14 genera in the family. Twelve or thirteen of the genera in Threskornithidae, with 29 extant species, are known as ibises: Bostrychia (African ibises), Cercibis (sharp-tailed ibis), Eudocimus (white and scarlet ibises), Geronticus (bald ibises), Lophotibis (Madagascan crested ibis), Mesembrinibis (green ibis), Nipponia (crested ibis), Phimosus (bare-faced ibis), Plegadis (glossy ibises), Pseudibis (South Asian ibises), Thaumatibis (giant ibis), Theristicus (South American ibises), and Threskiornis (sacred ibis and relatives) (Myers et al. 2008a). One or two genera, with six extant species, are known as spoonbills and comprise the subfamily Plataleinae: Platalea (Old World spoonbills) and Ajaia (American spoonbills) (Myers et al. 2008b), but sometimes only Platalea is recognized (IBIS 1998a). The family formally was known as Plataleidae. The spoonbills and ibises were once thought to be related to other groups of long-legged wading birds in the order Ciconiiformes, including the storks, the herons, and the bitterns. But a recent study suggests that they belong to the Pelecaniformes (Hackett et al. 2008). Whether the two subfamilies are reciprocally monophyletic is an open question. The South American Checklist Committee's entry for the Threskiornithidae includes the following comment: "Two subfamilies are traditionally (e.g., Matheu and del Hoyo 1992) recognized: Threskiornithinae for ibises and Plataleinae for spoonbills; because the main distinction has to do with bill shape, additional information, especially genetic, is required to recognize a major, deep split in the family" (SACC-AOU 2002). 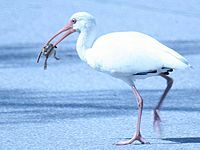 American white ibis captures a toad. Members of the family, both ibises and spoonbills, are typified by long, broad wings with 11 primary feathers and about 20 secondaries. They are strong fliers and, rather surprisingly, given their size and weight, very capable soarers. The body tends to be elongated, the neck more so, with rather long legs. The ibises are characterized by long, slender bills that are curved slightly downward. This is in contrast to the spoonbills that have a beak that is broad and distinctively flattened and does not curve downward, and that is sometimes enlarged at the tip (Marshall Cavendish 2001). While the down-curved bill of the ibises is used to probe shallow water and thick grasses to capture their prey, the spoonbill typically uses its bill to sift waters for food (Marshall Cavendish 2001). Ibises look similar to the herons, but they lack the kink in the neck that typifies herons and when ibises fly, they extend their neck fully, whereas the herons will pull their necks back to the shoulder (Marshall Cavendish 2001). Ibises are large birds, but mid-sized by the standards of their order. They range from the dwarf olive ibis (Bostrychia bocagei), at 45 centimeters (18 inches) in length and 450 grams (one pound), to the giant ibis (Thaumatibis gigantea), at 100 centimeters (40 inches) and 4.2 kilograms (9.2 pounds). Ibises usually feed as a group, probing mud for food items, usually crustaceans (such as crayfish), small fish, and soft mollusks (such as snails), with various species also consuming earthworms, insect larvae, leeches, and frogs. Most species nest in trees, often with spoonbills or herons. The word ibis comes from Greek, originally borrowed from Ancient Egyptian hîb. The sacred ibis (Threskiornis aethiopicus) was an object of religious veneration in ancient Egypt, particularly associated with the god Thoth. At the town of Hermopolis, ibises were reared specifically for sacrificial purposes and in the Serapeum at Saqqara, archaeologists found the mummies of one and a half million ibises and hundreds of thousands of falcons (Gleming and Lothian 1997). The sacred ibis no long is found in the Nile basin, although it is found in parts of sub-Saharan Africa and in Iraq, and has been introduced in various nations, including France, Italy, Spain, and the United States (south Florida). Among the about 30 species of ibises, at least six are threatened, and of these six there is one listed as Endangered and three as Critically Endangered (Michael Cavendish 2001). Among the Critically Endangered is the giant ibis (Thaumatibis gigantea), which has an estimated population size of but 50 to 249 individuals, found in parts of northern Cambodia and southern Laos (BL 2008). Myers et al. 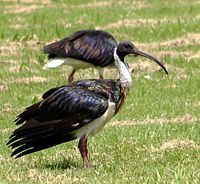 (2008) places the critically endangered giant ibis, Thaumatibis gigantea, within the Pseudibis genus (south Asian ibises) as Pseudibis gigantea. BirdLife International. 2008. Thaumatibis gigantea In IUCN, 2008 IUCN Red List of Threatened Species. Retrieved February 10, 2009. Fleming, F., and A. Lothian. 1997. The Way to Eternity: Egyptian Myth. London: Duncan Baird. ISBN 0705435032. Hackett, S.J., R.T. Kimball, S. Reddy, R. C. K. Bowie, E.L. Braun, M.J. Braun, J.L. Chojnowski, W.A. Cox, K.-L. Han, J. Harshman, C.J. Huddleston, B.D. Marks, K.J. Miglia, W.S. Moore, F.H. Sheldon, D.W. Steadman, C.C. Witt, and T. Yur. 2008. A phylogenomic study of birds reveals their evolutionary history Science 320(5884): 1763-1768. Retrieved February 10, 2009. Integrated Taxonomic Information System (ITIS). 1998. Threskiornithidae ITIS Taxonomic Serial No. : 174922. Retrieved February 10, 2009. Marshall Cavendish Corporation. 2001. Endangered Wildlife and Plants of the World New York: Marshall Cavendish. ISBN 0761471995. Retrieved February 10, 2009. Myers, P., R. Espinosa, C.S. Parr, T. Jones, G.S. Hammond, and T.A. Dewey. 2008a. Subfamily Threshkiornithinae (ibises) Animal Diversity Web. Retrieved February 10, 2009. ———. 2008b. Threshkiornithidae (ibises and spoonbills). Animal Diversity Web. Retrieved February 10, 2009. South American Classification Committee, American Ornithologists Union (SACC-AOU). 2002. A classification of the bird species of South America American Ornithologists Union. Retrieved February 10, 2009. This page was last modified on 24 January 2018, at 17:18.